- Blue tongued skink has the brightest blue colored tongue of all animals on earth. 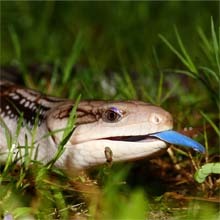 - Unlike most reptiles, Blue tongued skinks don't lay eggs but bear live young. - Blue tongued skinks from different regions have very distinctive patterning.